Help! Really not sure what time of year to visit Ireland. Well, if you’re flexible on when you visit, then we can definitely help with a simple rundown on the benefits of each season! Starting with spring. Self-drive through the rolling countryside and along the coast and you’ll see all the signs that winter has ended for another year. Keep watch for gorgeous new-born lambs in the patchwork of green fields, or head to the Irish National Stud to see some of its new-borns: foaling season is February to June, so this is a fabulous place to visit, maybe topped off with a trip to the races at The Curragh, or for some shopping heaven at Kildare village. St Patrick’s Day is also in March, so you can either celebrate it as a festival in Dublin, or head to St Patrick’s Country in Down and Armagh! And, of course, you’ll find our big hitter sights, such as the Giant’s Causeway, the Carrick-a-Rede rope bridge, Newgrange and the Cliffs of Moher are all just a little less crowded in spring. Moving onto summer. Whilst our weather can be a little unreliable, it’ll always be mild and temperate in general, so taking on a hike around County Wicklow’s Glendalough or the Mourne Mountains in County Down is a joy – just wear some layers and the views will take your breath away. Watersports are also big, so either watch those who dive in for surfing, kayaking or sailing, or join in the fun yourself! With the gulf stream swinging by our Wild Atlantic Way, the waters around here are not too cold at all! Summer is also peppered with festivals up and down the island: brighten your days at Dublin’s Bloom Fest, Kilkenny’s Arts Festival, Dalriada Festival in County Antrim, and the Geesala Festival in County Mayo, which has live horse racing on the white sands of Doolough beach. Whether you call it autumn or fall, as the leaves change from green to warm tones of orange and purple, warm yourself by the open fire this autumn in some of Ireland’s pubs. Fill your ears with trad music under the thatched roof of The CrossKeys Inn in County Antrim or devour some mouthwatering local food in Gallagher’s Gastro Pub in Cork city. Festival season is in full swing this season, too! Check out DerryHalloween – voted the world’s best Halloween spot in a poll by USA Today’s 10 Best online poll, catch the Dublin Theatre Festival or the Guinness Cork Jazz Festival. If you’d prefer to take in the crisp autumn air, then join a walking festival – organized trails where groups that start out as strangers walk together and end up as firm friends, it’s an Irish speciality, and Wee Binnian Walking Festival is one of the best! Finally, definitely don’t discount winter in Ireland as it’s not that cold. We have some wonderful Christmas markets all over the island, we have places serving up some of our special winter warmers – Irish coffee or Irish stew, anyone? Not forgetting one of our best-kept secrets: the spectacular light show that happens on the winter solstice at County Meath’s Newgrange passage tomb (at 5,000 years, it’s older than the Pyramids of Giza). Or if you prefer, you can chase the Northern Lights yourself along the rugged coastline of the Inishowen Peninsula and the Causeway Coastal Route. 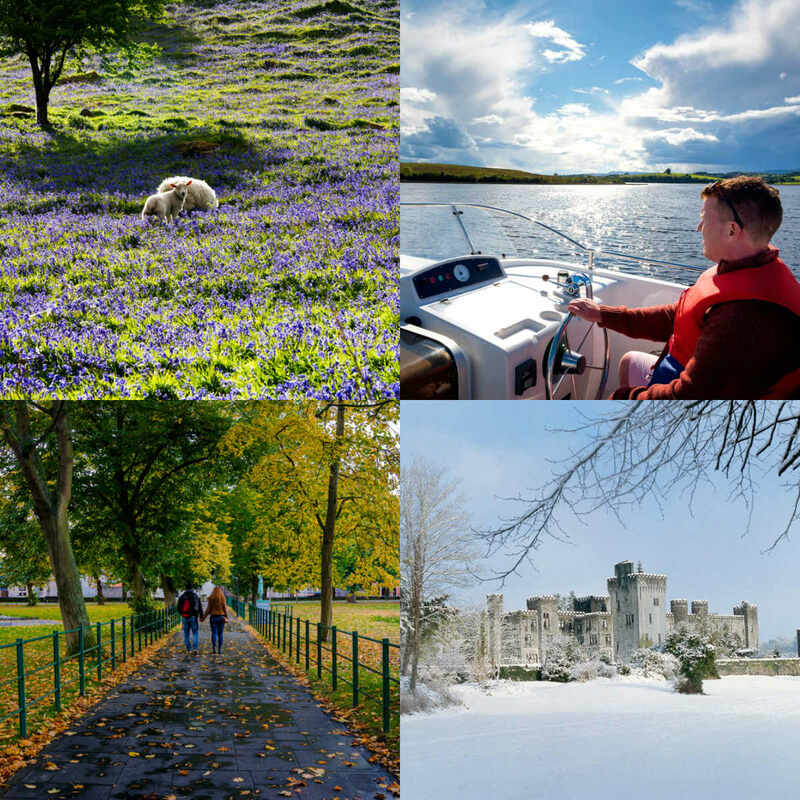 You see, the island of Ireland is a pretty wonderful place to visit –whatever the season! Do any other community members have any other thoughts about seasons in Ireland?